Stuttgart struggled to a 1-1 draw at Werder Bremen in Bundesliga. 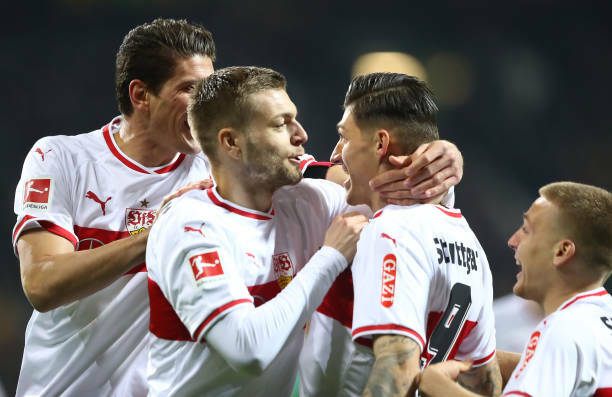 Stuttgart, who remain in the relegation zone having not won any of their last eight games, claimed a shock lead in just the second minute through Steven Zuber, who tucked the ball away after being played in by Mario Gomez. But Bremen extended their run of scoring to 24 consecutive Bundesliga matches as former Everton midfielder Davy Klaasen notched on the stroke of half-time. The Netherlands international's long-range strike flew past Stuttgart goalkeeper Ron-Robert Zieler. The hosts looked the more likely side to find the winner as the second half wore on. Nuri Sahin tested Zieler with a powerful effort from inside the penalty area before Claudio Pizarro fired just wide. Zieler was on hand again 10 minutes from time to secure the point for Stuttgart, diving to keep out Theodor Gebre Selassie's close-range header.